We’ve got bunnies! 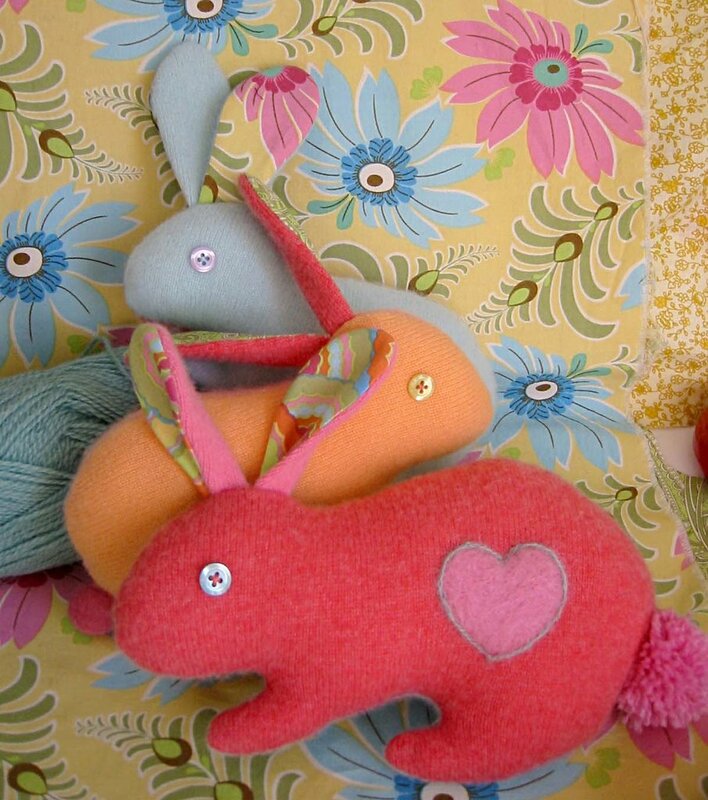 Super lux cashmere bunnies…mmm! I’ve acquired a lot of scraps from making recycled cashmere scarves last holiday. I’ve been trying to come up with a project that is scrap worthy. These are the perfect snuggle bunnies for the job. Buttons, pompom, felt ball, etc. **PLEASE NOTE: for kids under 3 years old, do not attach buttons, felt balls, etc. Embroider or needle felt all embellishment. It’s safer and just as cute! I find second hand cashmere sweaters at Goodwill. Here’s a tip: If you have trouble finding them on the sweater rack, look in the blouse/long sleeve shirt area. Wash in hot water and dry in the dryer. They won’t felt, but they will shrink and get a little thicker and fuzzier. 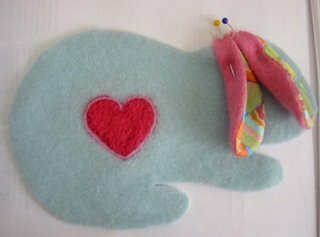 1) Cut a bunny shape out of scrap paper and pin to 2 layers of sweater. I’m using contrast colors with right sides together so I get both sides of the bunny. 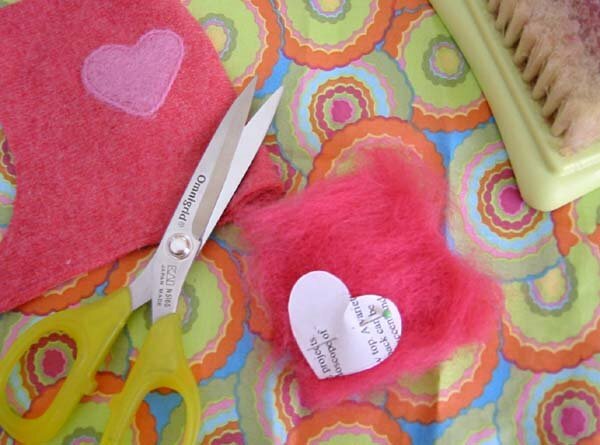 (make your own bunny shape by tracing a cookie cutter and enlarging. Or you can use mine) Cut 2 ears out of sweater fabirc and 2 ears out of a print lining. 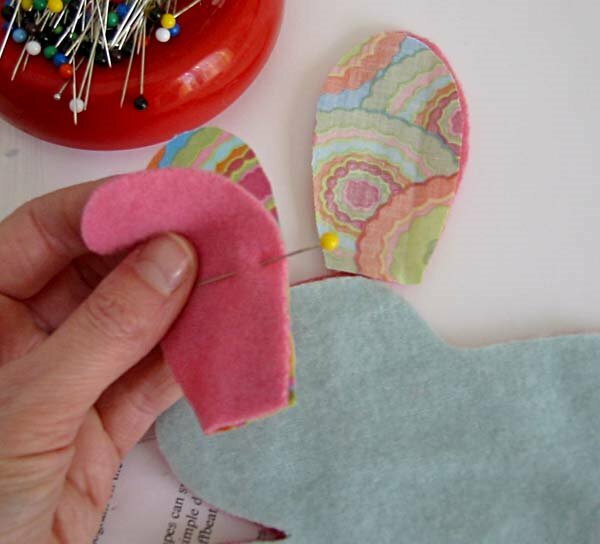 2) Place ear and lining right sides together, pin. 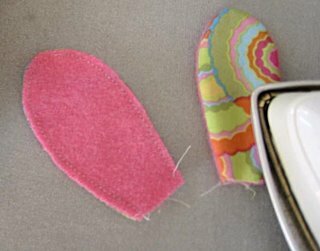 Stitch around perimeter (leaving bottom open) with 1/8″ seam allowance. 3) Turn right side out and press. 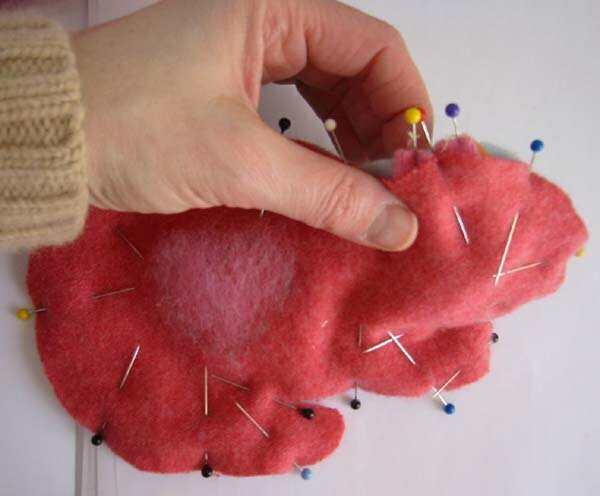 4) Now it’s time for a little needle felting embellishment on the bunny body. I use the Clover tools, which I did a tutorial on a while ago. First lay out some roving on the mat, crossing the direction of the fibers. 7) Carefully remove work from mat taking care not to stretch and distort the shape. Steam the back of the work to help set the fibers. 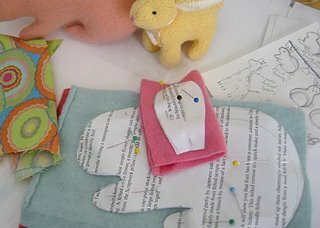 Repeat needle felting steps for the other side of the bunny. 8) Now it’s time to assemble! Fold a tuck into the bottom of the ears and pin onto one side of the bunny head. 9) Place the other side of the bunny on top, right sides together, sandwiching the ears between layers. Pin and stitch around perimeter of bunny, leaving a 2″ opening to turn work. 10) Turn work right side out and stuff with fiberfill. No, that little puff is not the tail! :) Hand baste the opening closed, then attach a tail. I used a pompom I made out of yarn for this one and a felt ball tail on the orange bunny. Sew on some button eyes and you’re done! Oh my goodness, they’re multiplying. 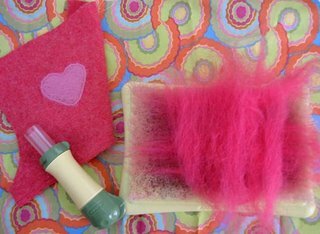 For needle felting supplies (roving, Clover tools, felt balls) I recommend the nice folks at ornamentea. Have fun and let me know if you make some bunnies! Those bunnies are adorable. I have to get to Goodwill now!! Great toot, too! Thank you so much!! !I am from Italy and i am not the only one who loves your works!! !this tutorial is very nice and it will be simple to do for me..thank you and i hope you will do a book about your works! !have a nice day and bless you!! So cute! Love the felted hearts on them. 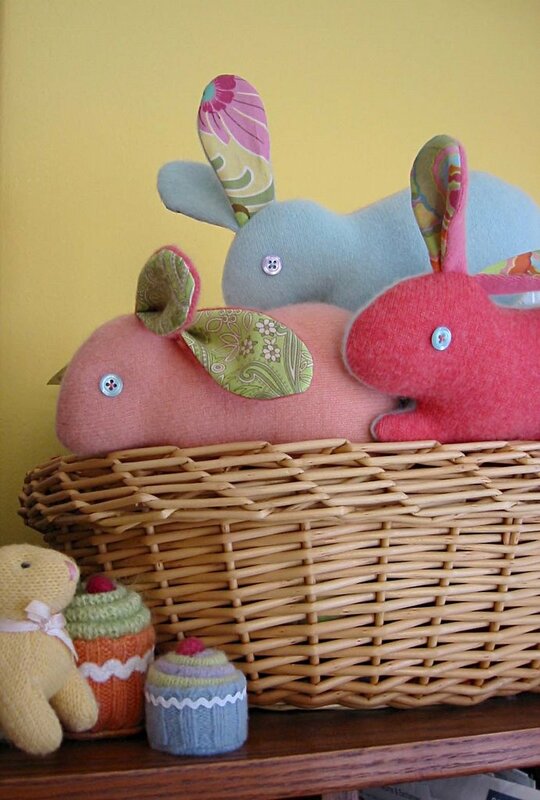 These bunnies are so cute – thanks for posting the tutorial! I can’t wait to try it out. Dear Betz,i posted on my blog with your permission about you..thanks again! Totally *love* these! I posted about them at whip up! Once again, you are amazing. I have a few cashmeres that really need to be felted – to old to wear out but still wear in – now I won’t have to totally part with them. Oh my goodness, those bunnies are some of the cutest things I have ever seen. Thanks so much for sharing with us! Wow, Betz. Thank you for the little bunny tutorial. They look like candy! This is wonderful! I have a few thrifting cashmere sweaters in my stash I’ll have to turn into bunnies! i’ve never found cashmere at my local thrift stores, but maybe i was looking on the wrong racks. ornamentea is local for me … not even 2 miles away. these are so cute!!! i must make some tonight…..thanks for the inspiration! and i love that they’re made from cashmere…. These snuggle bunnies are just the sweetest!! Those bunnies are so cute! I like very much your work, you are brilliant! I would like to link this tutorial from my blog. Is it possible?Thank you. Have a nice weekend! Those bunnies are beyond cute! I love bunnies and have collected them over the years. I’m thinking about making one or two! So cute!! I´ll try make one form my baby!! I’ve never worked with recycled sweaters but your work sure makes me want to try! You are fabulous for sharing this adorable pattern! So sweet! THank you for the great tutorial. We need more spring here! I love your rabbits! they’re so lovely! Thanks so much for such a cute tutorial! I’ll be making some of these pretty soon! Oh Betz, your tutorials are always so clear, concise and wonderful. The bunnies are perfect for Easter, cute! Gads I’m so completely loving these!!! 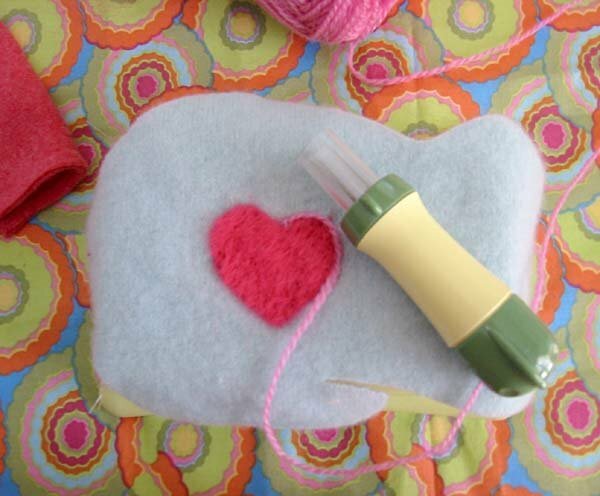 I have never done any felting but am so interested… thanks for the lovely tutorial! GADS I love these!! Have never done any felting but am so intrigued! Thanks for the adorable tutorial! Oh my gosh, that is so cute! I will definately try that out on my scraps. Way cute bunnies ! Thanks for the tutorial ! Hi, Betz! I lucked out a thrift store this week and picked up an embarassing number of cashmere sweaters. I tried your tutorial this afternoon, and it was perfect! What a thorough writer you are. Thank you for sharing. Oh I love these so much! I hope it’s ok if i mention it on my blog – http://fripperee.wordpress.com let me know if you object and I’ll remove the link! Thanks so much for this tutorial. I made three of these bunnies. Two for a birthday girl and then two for my girls who fell in love! What super cute bunnies! The felted hearts on them are just darling. Thank you for being so generous in making and sharing this wonderful tutorial! Oh, I think I’m in love! What could be sweeter than a soft bunny?! Thanks for the tutorial. These bunnies are so cute! Thanks for sharing them!! They are multiplying …. their babies are in France now !!! Come and see !! Oh my gosh these are just too sweet! Thanks for sharing. The bunny is way to cute! I tried my hand at making one. I used cream velvet and I can tell you that velvet was NOT a good choice. It looks “ok” but I could not stuff it as much as I wanted to because I was afraid I would burst the seams. I am going to make one out of wool. I have better luck with wool. Can I post a photo of my bunny with a link to your blog on my blog? I will have to try to make,thanks for the tutorial. What lovely bunnies – wish I had found this tute before Easter – perhaps I will be super organised for next year. VEEEERY cute!!!! I don’t even sew, but with your excellent instructions, I feel like I could attempt a sweet bunny of my own! I just found cashmere at my local thrift shop – for a quarter no less. I see a bunny in its future! Thanks for the pattern. Great photos of very cute bunnies. I wonder if some potpourri in the filling would be a nice touch? So cute and just in time for Easter! I did one up real quick and though it’s not the greatest I think my kids will enjoy it. This is the cutest tutorial, I am going to make some for my kid’s school teachers. I blogged about this as an Easter Project I love. Thanks so much for the cute pattern. I’ve got my first one made and three more to go. Did mine with a pink cashmere that didn’t quite felt as much as I’d like, and a brown/tan check that wouldn’t felt at all. So I added a bit of interfacing to stabilize both. Made the leg turns a bit trickier, so next time around I’ll try to find some light weight felt to work with. Thanks again! very nice! I might do this! :) thanks!!! So generous of you to share this gorgeousness. i think ima make one for my cousin that’s going to be born soon! these are super sweet and very easy! Thank you for the idea! do you mind if I mention this post in my blog? Thank you for your time! that is beautiful!very sweet your bany. i love your fabrik and the color. 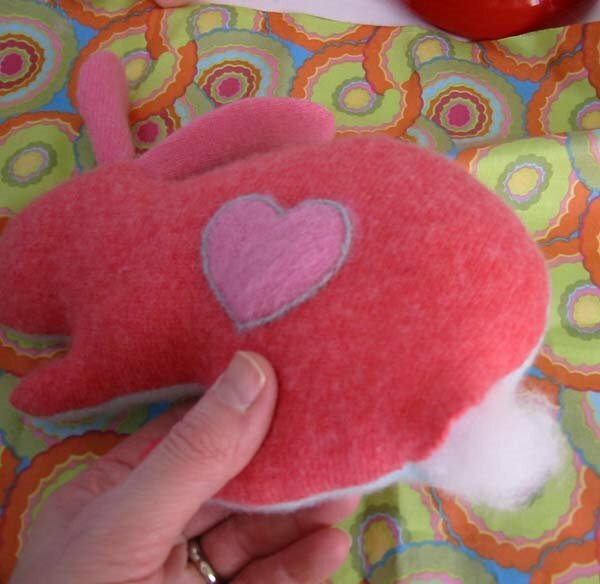 Did you stitch the bunny together by hand or machine? Can’t wait to make a few. I just felted a bunch of sweaters for this project! Thanks for the inspiration and great tutorial. I sewed this on the machine but you could also sew it by hand. So cute! I know some little ones for whom this project would be perfect. Thank you so much for these adorable creatures! I just finished making one for my daughter for Easter. I created a tail from some left over faux fur. So cute! i can’t wait to give her her new “hop hop”! awwwwwwwwww they are so adorable. i’ve been looking for bunny patterns to gift my new baby niece, and i’m making this one with embroiderd eyes.. thanks for the pattern and tute! Oh my this is lovely. I plan to add it to a post I do every Friday on internet finds. I wish I had found this pre-Easter. That was vary cute bunny! I can’t wait to try it myself. Although, I might look for an alternative for the cashmere sweater – still can’t part with the one I have. Thank you for sharing that bunny craft. I loved it! They look so dainty and neat. 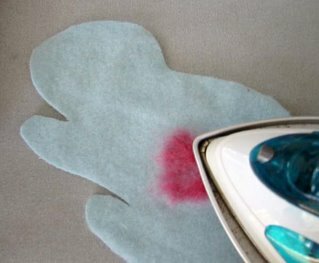 Can you share more tips on recycling a cashmere. I’m a huge fan. Appreciate it. Lovely! Very lovey! I can even teach my 5-year old girl to do that. I love you concept with cashmere. I love the feel of cashmere clothing. I am pregnant right now and I want to thank you for sharing this wonderful craft. I finally found something to do. The bunnies are amazing, really adorable. aaawwww. so cute. I am going to teach my kids how to sow these. Thankyou so much for sharing these crafty tips. I am subscribing. hmm this will make a good sunday afternoon activity for me in front of the tv. Absolutely gorgeous i have been looking for a special bunny to make for my grandaughter who has just moved to Aussie as i am unable to give her easter eggs this year,so this will be lovely for her bedroom. A million thanks. These look so cute and soft! I included these in my link love today. Thanks again for sharing you talent. love your cashmere bunnies. I’m pretty into crafts but I don’t generally have time to do any of them at the moment. Hi,obrigada pelo passo a passo. thanks so much for sharing this pattern! i just stitched up one for my boys and it came out so stinkin’ cute! What a great idea! I was about to throw away a scarf and found this! Lovely bunnies! I’ll try to make one for my daughter! Thanks for the cashmere bunny tutorial, I’ll try it soon. Thanks a lot for these cute bunnies. I’ve made several of them on my blog, and created a hen pattern, that can be also used. I just love them all. Bye ! 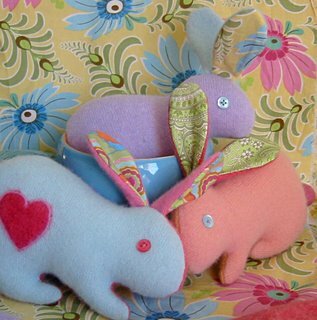 do you still have the pattern for these bunnies available? Yes! The link to the template should be working again now.